- Subsequent rehearsals and workshops will also take place at this venue. - Unfortunately we will not be able to accept video submissions. We also judge castings upon timeliness & reliability in attendance, and via group work. Please visit our auditions page for an overview of what to expect at our castings. - Anyone aged under 16 MUST be accompanied at all times by a parent. 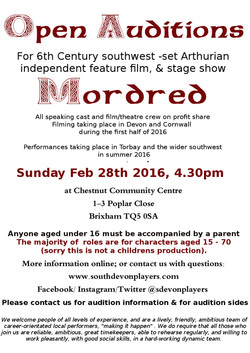 Audition script sides will be available from mid-November onwards, by emailing southdevonplayers@gmail.com, with "Mordred" in the subject line. Involvement in this show is on our profit share terms, which you can read here. We would be delighted to hear from interested film crew - please get in touch with us on email, to arrange a meeting and interview. Previous experience needed on these roles. Please note that these are selected roles, and not the entire character list, as a few roles are already cast. Anyone aged under 16, must be accompanied at all castings, rehearsals, and filming/ performances, by a parent or legal guardian. Non-combatant roles are Taliesin, Iddawg, Melwyn, Gitta. Guinevere. Anna has a scene involving having her clothes torn by a male character.